For food emergencies, I always tend to have one of three instant food items in the house: frozen dumplings, instant noodles and frozen pierogis. Frozen pierogis, homemade or store-bought, are a lifesaver when I’m out of my mind hungry and I can’t decide what to make. I love those tiny pillows filled with potatoes and cheese! For the times when you don’t (GASP!) 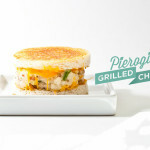 have any frozen pierogis in the freezer, this grilled cheese will definitely satisfy your pierogi craving. I present you with the pierogi grilled cheese: fluffy bacon-green onion-sour cream-mashed potatoes layered with cheddar between two slices of bread and grilled to golden perfection. 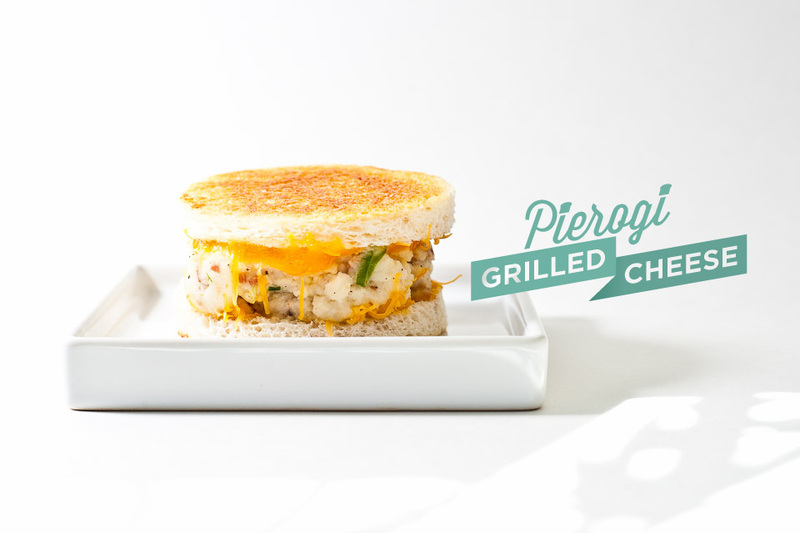 i am potato-filled, i am grilled bread: i am pierogi grilled cheese! 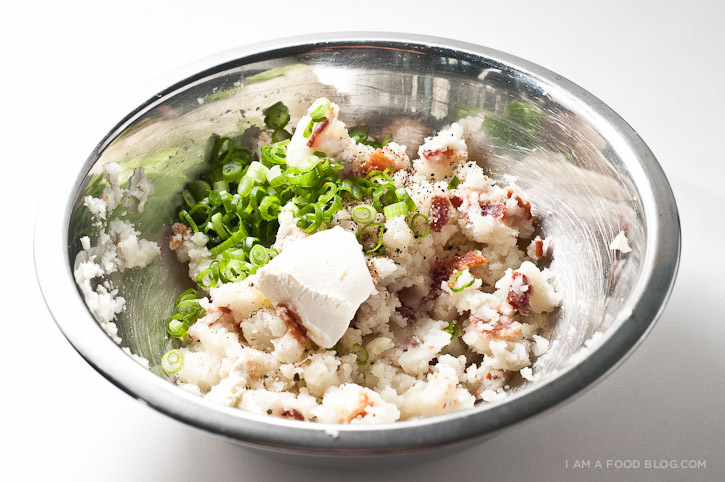 Mix together the potatoes, bacon, green onions and sour cream. Taste and season with salt and pepper. Heat up a pan on medium-low heat. Butter one slice of bread and place it butter-side down in the pan. Top it with half of the cheddar cheese and the potato mixture. Make sure the potato mixture is evenly spread to the edges. 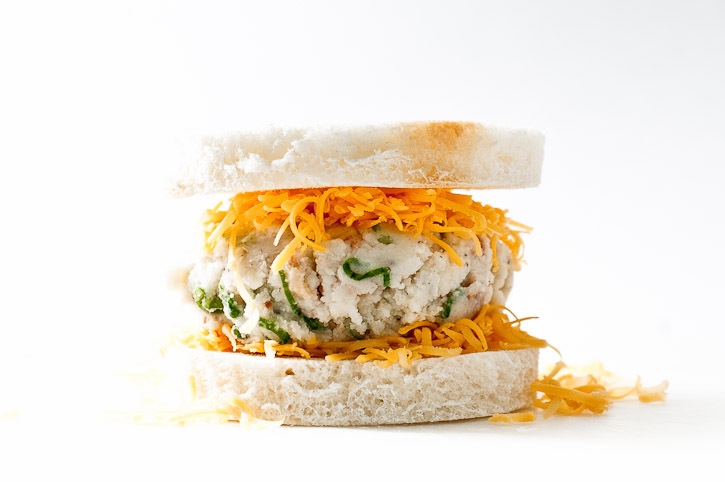 Top with the remaining cheddar cheese. Butter the last slice of bread and place on top, butter-side up. By now the cheddar cheese should be a bit melted and the bread touching the pan should be slightly golden. Keep and eye on it and flip with golden brown and toasty. Toast the other side until the cheese is melted and the toast is crisp. Remove from the pan and enjoy hot. This is amazing. Growing up I thought grilled cheese was a food group. I’m starting to think it might still be possible… look at that beauty! I must confess…I didn’t have any leftover mashed potatoes…I had to make a fresh batch (that promptly disappeared). I was figuring that most non-potato monsters would have leftovers. This looks so amazing that I immediately forwarded it to all my friends. We always have pierogis in our freezer, too! I will be trying this recipe shortly. This is pretty awesome. 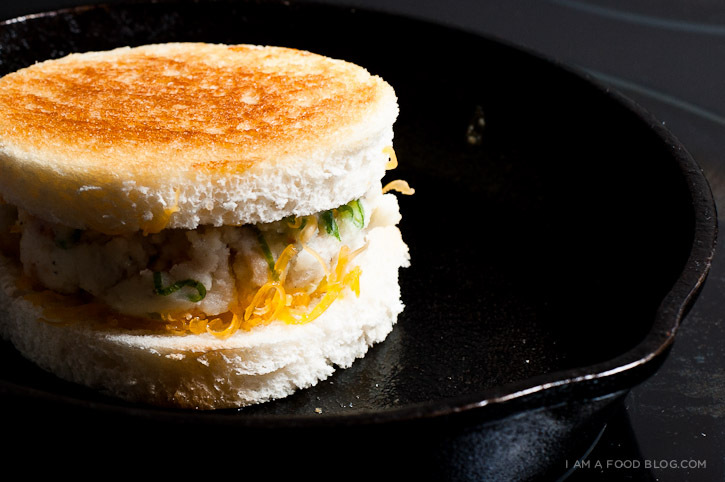 Love this unique take on the comfort food classic! AWESOME!! my mom’s side of the family is Czeck, and I still have aunts that make pierogies FROM SCRATCH at x-mas every year(soft as a baby’s bottom!! )….I cant wait to give this a try!!! Yah, of course it’s a variant on pierogi, and not an actual pierogi recipe. That’s because it’s a sandwich. Sometimes I feel like people get a little overenthusiastic about claiming exclusive knowledge of culturally based recipes.